Talented, qualified soldiers could get promoted more quickly as the Army’s new noncommissioned officer professional development system falls into place. The effort, which stems from the Army’s NCO 2020 initiative, ties together several major changes to the way the Army trains, educates and retains its NCOs. This includes reducing retention control points for senior NCOs, making education a requirement for promotion, and incorporating an all-in system for senior NCOs being considered for top jobs across the force. The changes will result in an Army that’s better able to leverage the knowledge and experience of its junior NCOs, many of whom have fought in Iraq and Afghanistan for more than a decade, said Sergeant Major of the Army Dan Dailey. "They’re very mature, they’ve fought in combat," Dailey said. "The ability is there, and the fact behind the fact is they’re younger." Creating promotion opportunities for the Army’s best and brightest will ensure the service gets the most out of its soldiers, Dailey said. "This is all nested with moving back to promotion systems where we promote sergeants major sooner," he said. Today, about 69 percent of sergeants major in the Army have between 27 and 32 years of service, Dailey said. During the height of the wars in Iraq and Afghanistan, "we started keeping people longer," he said. "It kept moving to the right and moving to the right, and then it backlogs because you can’t promote." The average soldier who’s selected to attend the Sergeants Major Academy has almost 23 years of service, Dailey said. Once selected, it takes soldiers about two years before they graduate from the Sergeants Major Course and are assigned as sergeants major, he said. That leaves just a few years or so before they "time out" and decide or are forced to retire, Dailey said. "It’s an unsustainable thing," he said, adding that it takes time to grow experienced, senior-level sergeants major who can serve alongside three- and four-star generals at major commands. "It’s all about utilization," Dailey said. "This gives me an opportunity to use you longer if you’re very talented and not run out of time. I have very talented sergeants major now, but I’m running out of time to use them." Some might argue that older soldiers bring with them more experience, Dailey said. "I got it, but the problem, simply, is do they really need to be that [experienced] to be able to do this job?" he said. "Well, if we’re training them appropriately, the answer’s no. What we’re saying is that we have no value in our education system if we say that you have to stay in this long to be able to do this." 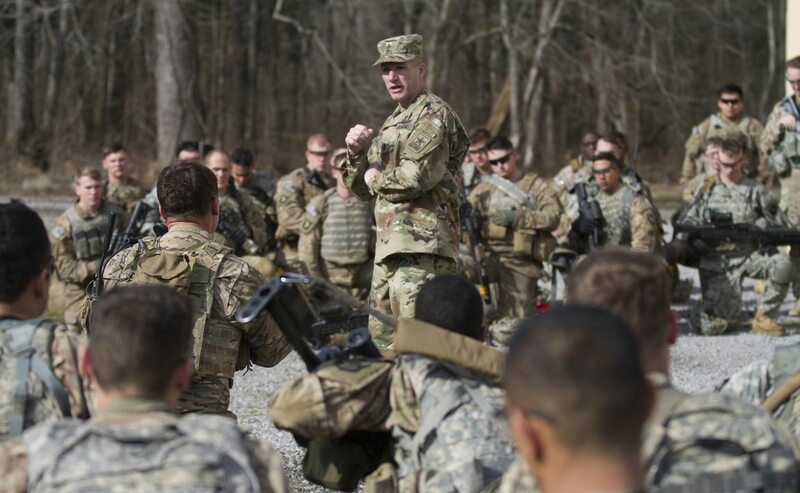 Sergeant Major of the Army Dan Dailey is rolling out a new NCO professional development system designed to improve soldier education and promote more quickly talented, qualified soldiers. Here, 1st Sgt. Kevin Mulcahey and Sgt. 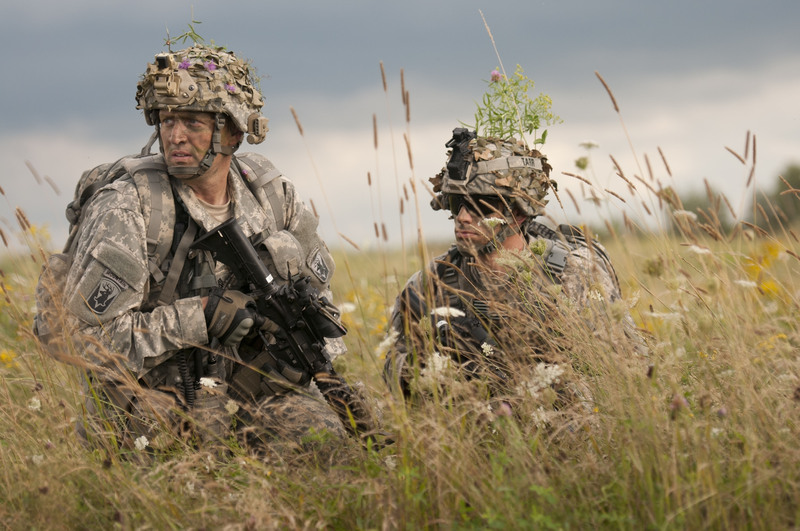 Nicholas Tarr of 1st Squadron, 172nd Cavalry Regiment, prepare to move during an air assault exercise at Fort Drum, N.Y. If the Army’s new NCO professional development system works, NCOs could be selected for the Sergeants Major Academy as early as 15, 16 or 17 years of service, Dailey said. This gives qualified soldiers upward mobility while also ensuring the Army can get the most of out of its soldiers before they retire, he said. "What typically happens in an organization that has no upward mobility, the very talented leave and the untalented stay," he said. "What you want to do is create opportunity. If a soldier is this rank, and they’re better than this other soldier, why are we going to hold him back? Do we have to promote people sooner? No, but when we want to, we can." The system also is designed to force out soldiers who are not meeting the standards, Dailey said. "There’s no free ride anymore," he said, including for sergeants major. "You’re going to earn your keep every day, just like you expect a soldier to do." Dailey said he understands that the Army has implemented many changes affecting the NCO corps over the last few years. "I know we’re throwing a lot of change into the force, but there is a method to this madness," he said. "If you look at this holistically, we have actually figured out what we can implement incrementally without breaking the system." There are risks, Dailey said, especially as the Army continues to shrink and when you’re dealing with a matter as complex as personnel. And because it affects people, it also becomes an emotional issue, Dailey said. "But we were heading in a direction that was unsustainable, and it was going to be cataclysmic," he said. Dailey cited as an example the signal community. Every year, the Army forecasts how many senior NCOs it might lose to retirement or attrition, Dailey said. "You really don’t know how long people are going to stay, right?" he said. "We know the average, we have some historic data, but it requires a lot of attention because you can make a mistake." This past year, the Army predicted that 30 sergeants major in the signal community would retire, Dailey said. Instead, that number doubled to about 60. "For no detrimental reason, there’s nothing going on, nobody’s complaining or anything like that, it just did," he said. "How do I turn the sergeant major machine on? You can’t crank it faster. They’ve still got to go to school." But because of the Army’s recent move to reduce retention control points for senior NCOs, 31 NCOs from the signal community were selected to attend the Sergeants Major Course, putting in motion the process to groom replacements for the additional 30 sergeants major who are retiring, Dailey said. Without the RCP reductions, only five would likely have been selected for the Sergeants Major Course, he said. "You’ve got to alleviate risk," he said. "We’re all rolling the dice, thinking, ‘OK, what’s going to happen when I say everybody’s all in? What’s going to happen when I extend people to 30 months in their positions? What’s going to happen when I do RCP reductions? What’s going to happen to the community?’"
Sergeant Major of the Army Dan Dailey is rolling out a new NCO professional development system designed to improve soldier education and promote more quickly talented, qualified soldiers. Under the new NCO professional-development system, soldiers must complete the appropriate levels of Structured Self-Development and professional military education before they can be promoted. For example, SSD1 and the Basic Leader Course are required for promotion to sergeant, while SSD2 and the Advanced Leader Course are required for promotion to staff sergeant, and so on. Soldiers who meet all the requirements should expect to make sergeant in three to five years, staff sergeant in five to seven years, sergeant first class in nine to 12 years, master sergeant in 12 to 15 years, and sergeant major in 17 to 20 years, according to a chart provided by Dailey. The system allows for flexibility, giving the Army room to speed up promotions for qualified and talented NCOs. It also lays out a comprehensive timeline and training and education opportunities tailored for sergeants major to work their way up from battalion-level sergeants major to those qualified to serve a four-star commander. Soldiers also must abide by tighter retention control points at the senior NCO levels. Beginning Oct. 1, the Army reverts back to the RCPs it had in place before the 2007 surge in Iraq, shortening the amount of time career soldiers can stay in uniform without getting promoted. The lower RCPs create upward mobility; increase promotion rates for sergeant first class, master sergeant and sergeant major; and reduce the need for Qualitative Service Program boards, which screen NCOs for involuntary separation or retirement in specialties that are over strength or have stagnant promotion opportunities, or both, officials said. Under the new rules, the retention control point for sergeants major is 30 years instead of 32. It is 26 years instead of 29 years for master sergeants and 24 years instead of 26 years for sergeants first class. RCPs for the other grades remain the same. The Army also is moving toward a better, more personalized talent management system for its senior NCOs. For example, students at the Sergeants Major Academy used to just receive, by mail, their follow-on assignment on what was known as Black Friday. "That’s not happening anymore," Dailey said. "Now, your talent manager comes down and talks to you, sits down with you, reads your file." The goal is to better match soldiers with their abilities while balancing the needs of their families, Dailey said. "If we can meet the needs of the Army, the soldier and the family, we’re going to match you with your skills based upon the needs of the Army, instead of this random Black Friday," he said. "If you’re the number one qualified person for a battalion that’s open in Fort Bragg, and you and your family want to go there, that’s a win-win for the Army and the families." Michelle Tan is the editor of Army Times and Air Force Times. She has covered the military for Military Times since 2005, and has embedded with U.S. troops in Iraq, Afghanistan, Kuwait, Haiti, Gabon and the Horn of Africa.